Kittens need large quantities of protein. Proper diet and nutrition is a key predictor of adult health in kittens. A healthy diet will ensure proper growth and development, minimize the risk of disease and keep your kitten's teeth clean and healthy. Kittens can eat a variety of foods depending upon their age. Cats are carnivores, and protein should constitute a significant portion of their diet. After kittens are weaned, meat is the most important ingredient in any diet you choose to feed. However, wild cats get access to plant matter when they eat the stomach contents of their prey, so a diet consisting solely of meat may result in nutritional deficits. For the first several weeks of life, a kitten's sole source of nutrition should be her mother's milk. Mother cats typically begin weaning their kittens when they are around 4 weeks old and complete the process between 8 and 10 weeks. You can begin incorporating very soft solid food as your kitten is weaned, and can introduce a full diet of solid food when the weaning process is completed. Orphaned kittens should get kitten formula, not cow's milk. Cat food companies list ingredients according to the proportion of each in the food. Thus the first few ingredients are the most significant portion of the food and should be meat, not filler such as corn or grain. High-quality cat foods tend to have fewer preservatives and fillers; to avoid these, choose a food with ingredients that have names you recognize. Kittens can eat either wet or dry cat food, but dry food is generally higher in healthy ingredients with less moisture and filler. For freshly-weaned kittens or kittens still being weaned, feed dry food softened in warm water. 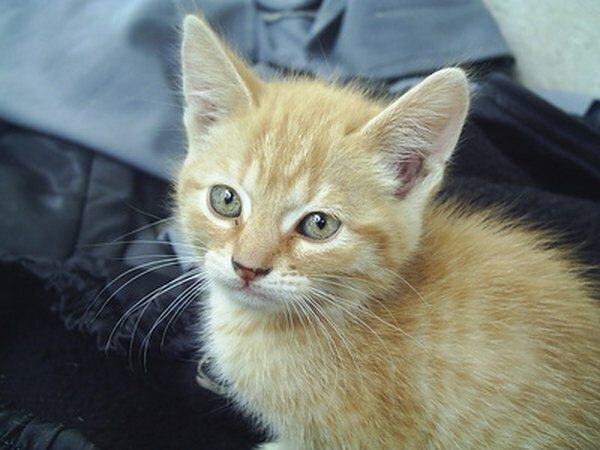 Kittens can eat meat intended for people, but should not get junk food such as potato chips. Vegetables contain cellulose, which cats cannot metabolize. If you opt to feed your kittens vegetables, puree them first to help break down cellulose and give your kitten access to the nutritional value of plant-based foods. While some cat owners feed their cats a raw meat diet—and some veterinarians agree that this diet can be healthy—kittens' immune systems are still developing and therefore they should not eat raw meat. Can Kittens Eat Ice Cream? What Kind of Food Is Healthy for Kittens? What Types of Bird Seeds Do Cockatiels Eat? When Is It Time to Switch a Kitten to Drinking Water?